This week two Asian artists stood out, one because a gallery in New York premiered an exhibition of his photographs, and the other because he died a famous man, leaving behind an unusual legacy. Both, Hiroshi Sugimoto and Thawan Duchanee use, respectively used the Buddhist iconography as a means to an end. In his introduction to his “Sea of Buddhas” created in 1995 Sugimoto opts for a tradition-based pictural language and reasons that the non-abstraction of the earlier art will perdure while the “minimal and conceptual art” of the seventies may not “survive another eight-hundred years”. One internet page has his accelerated Buddha, and another shows some of his photos. As said above Hiroshi Sugimoto uses the Buddhist iconography as a means. It allows him to explore techniques in fields not used before. 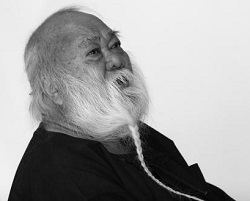 Thawan Duchanee died September 3, 2014 at the age of 74. He suffered from a kidney failure. The most remarkable legacy of Thawan is his Baan (house/hamlet) Dam (black) in Chiang Rai, northern Thailand. As the sun in that part of the world lights everything up even black becomes a colour Thawan once said. In 2001 he received the Fukuoka Asian Cultural Prize which earned him the title “a master of modern Asian art”. Once this prize in his possession the criticism of his countrymen ceased; he became famous. Thawan Duchanee too used the Buddhist iconography, plus its most important concepts as tools to create works of art that were not meant to please at first sight. This is unusual in Asia where, knowingly or unknowingly, master Kung’s (Confucius) adage is held that at least all music should contribute to harmony among mankind and to man’s feeling of wellbeing as an individual (“man” used in the literal sense of the word; Master Kung was not an admirer of womanhood as an intellectually and/or artistically gifted species). This concept that music, and as result all other art should please and appease in the first place has been carried throughout East- and South-East Asia and still lives. One day Thawan’s son Doytibet Duchanee had a conversation with an Australian art lover. One of the things that made Thawan stand out is that he profusely made use of animal skins, which’ use is not so much Buddhist, or not Buddhist at all, although Buddhists in Southeast Asia eat meat. Thawan’s exhibition of tiger an lion skins is amazing, puzzling, and a sign of his recalcitrant nature: whether they like it or not, I do it, just because they don’t like it. At the end of the conversation with Doytibet the interviewer takes up the habitual Western trend in trying to find the soft spot in the other party, this in order to analyze the character and eventually win the upper hand: — he too is but a …. ; I shouldn’t feel inferior. “What would you says was your father’s most favourite piece of art”, the interviewer asks, … “[something] that he feels most personal with?” Doytibet instantly recognizes this nasty invasive habit of fishing after the all too personal. Standing next to a number of white tails (of horses?) he says: “For me he liked Santa Claus … You see, he [Santa] had a beard, a white beard”. End of conversation. His interviewer knows he crossed a line and bows out with the female greeting “kapkoonkaa”, Doytibet replies with the male “kapkoonkrap”. Funny. Telling. Enlightening.